Klat magazine is a periodical made up solely of interviews (long ones, in-depth and the best) with key players in contemporary art, design and architecture. It’s an up-to-date archive of conversations and views, a rich selection of questions and answers, thoughts, images and words: to enjoy and to collect. Each issue presents the ideas, stories, challenges and interests of eight leading figures in contemporary visual and design culture. 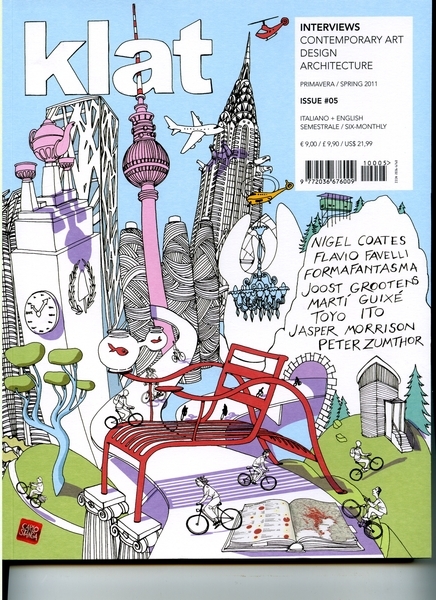 Klat magazine is published in a bilingual edition (Italian + English) and is distributed through over a thousand sales points, selected among newsstands, bookshops and concept stores in thirteen countries: Italy, Germany, the United Kingdom, France, Sweden, Belgium, China, Hong Kong, Malta, Singapore, Japan, Australia and the United States. It is also available in a digital version for iPad (App Store>Zinio), Mac and PC. You pay for it once and can read it on any of the systems. Klat (Talk written back to front) is a publishing project launched at the end of 2009 with the aim of exploring the many-sided world of contemporary art, design and architecture, through a close encounter with its protagonists. The project consists of a print magazine made up solely of interviews and a web platform that focuses on artists, designers, architects and other creative figures, adopting the format most widely used on the internet: the blog. The investigation carried out by the magazine through interviews extends to the web, bringing together a growing number of blogs written by the best-known and most promising names on the contemporary international scene linked to art, design and architecture. The objective is to create a platform of collective intelligence, a constantly evolving map of ideas and knowledge. The creative process, insights, projects and views of the various key figures involved are making up a polyphonic workshop open to comments from readers, a multi-voiced journal of creativity, a place of information and experimentation. Klat (magazine+website) has chosen to focus on contemporary art, design and architecture because they have the energy to reexamine the world, to redefine and reshape it. And the challenge of Klat is to frame a new vocabulary, an unprecedented interaction, new modes of comparison. Passing from Talk to Klat: a new way of talking.